A very grim morning today, I left home at 6am in heavy rain. I parked by the water works entrance off of the A228. As i parked up 2 Nightingale were singing close together either side of the road by the Water Works entrance. These were the first of 8 Nightingale heard this morning. NIGHTINGALE SINGING IN THE RAIN! I added two new migrants for the year to add to yesterday's Swift. 2 Sedge Warbler (getting quite a scarce bird here now) were seen and heard from the path that runs through the sunken marsh at the top of Abbey Mead, also 2 of 6 Reed Warbler heard today were there. 16 Sand Martin, 9 Willow Warbler, only 4 Chiffchaff, 4 Whitethroat and 11 Blackcap were also noted. Well done on getting out today Steve! It was grim this am. Now all the migrants are filling up the prime breeding areas, maybe us in the sub - prime market might get the overflow ! 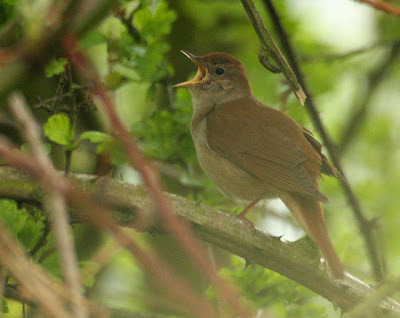 Great Nightingale photo, nice one! Great walk this morning. Pleasure to meet you. I managed to see the Little Gull on Brooklands - my closest view of one ever!